Angelenos have the chance to literally eat their feelings next week when a group of local bakers will gather to raise awareness about mental health issues with a very unusual bake sale. Instead of a rainbow of colorful icings and sprinkles (ugh, how predictable! 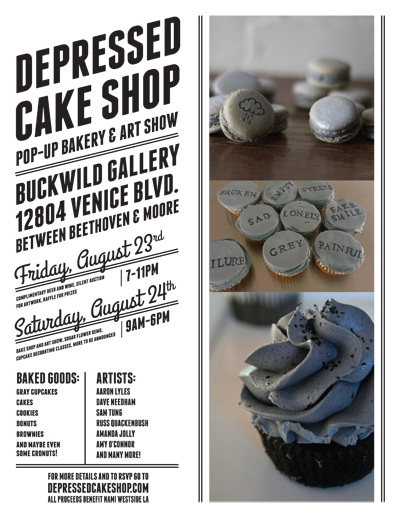 ), the Depressed Cake Shop pop-up in Venice is serving pastries in blue, gray and black hues with a mental health twist. Think sugar cookies shaped like prozac pills, gray donuts with sad words written in the icing and blue velvet cupcakes. Photo of some test run donuts for the Los Angeles event by Rebecca Swanner. PR specialist Emma Thomas in the U.K. came up with the idea for Depressed Cake Shops in August as a way to lift the stigma around mental health issues in a light and easy way. Anyone can organize their own pop-up events, said Thomas to CNN, and her company will even pitch in with PR help -- provided the baked goods are gray and the proceeds are donated to a local mental health charity. The Los Angeles event, for instance, is donating sale proceeds to the Westside LA branch of the National Alliance on Mental Illness. But while the cake shop theme is tongue-in-cheek (chocolate brains, anyone? ), depression is no laughing matter, says Los Angeles event organizer Rebecca Swanner. Photo of some test run cake pops by Miss Ali's Cake Pops. "Depression isn't something to joke about," wrote Swanner in an email to The Huffington Post. But sometimes "depressed" desserts can convey a surprising amount about the hurdles depressed people face -- while still being a tasty treat. "For instance, at the London shop, there were Misfortune Cookies created by Miss Insomnia Tulip that had sayings such as "snap out of it," wrote Swanner. "Those cookies reflect the concept that depressed people [are] often told just 'snap out of it.' But depression doesn't work that way. You can't just 'snap out of it.'" Swanner, who owns her own baking company called Secret Marmalade, has dealt with depression throughout her life. Baking gave her confidence and a creative outlet that helps lift her up when she's down, she explained. Photo of some test run chocolate-covered oreos by Miss Ali's Cake Pops. Other local bakeries Ninja Baking and Miss Ali's Cake Pops are getting involved. Ninja Baking will donate Plum Wine Cupcakes, while Miss Ali's is making Cloud and Monster cake pops and dipped oreos. For anyone who wants to get involved, Swanner is still looking for more dessert donations from LA's professional baking community. COST: Free admission, all items individually priced. Proceeds will benefit the Westside LA branch of the National Alliance on Mental Illness. HOW: RSVP to the event on Facebook. To get involved, contact host Rebecca Swanner at secretmarmalade@gmail.com.